Producers of Scottish Seafish, Fish & Seafood Sales, Fishing Vessel Management, Chandlery & Net Making. two profiles were found for Caley-fisheries.co.uk in social networks. Among other social networks the website is represented in Facebook and Twitter. The web server used by Caley-fisheries.co.uk is located in Great Britain and run by Fast Hosts LTD. On this web server 91 other websites are hosted. The language of those websites is mostly english. 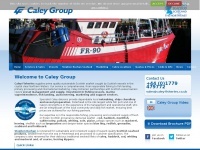 A Nginx server hosts the websites of Caley-fisheries.co.uk. The website uses the latest markup standard HTML 5. Indexing the data of the website and following hyperlinks on it is explicitly allowed by robot information.